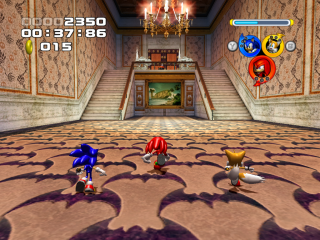 Mystic Mansion is the twelfth stage in Sonic Heroes. Finally making it inside the massive fortress of Hang Castle, the Heroes teams find themselves confronted by even more spooky weirdness. Unlike Hang Castle, the switches in this level teleport the teams to other rooms that resemble the room they've left off instead of turning the rooms upside down to look like they are altered, but their rooms on this level have different access. Pictures come to life as their subjects climb out of the walls; mischievous skeletons hide behind doors that go nowhere; corridors loop back on themselves before abruptly straightening out; and vast spiderwebs hang above bottomless black voids. There is also a secret well at the bottom of the castle that opens into a wavy, ghost-filled pocket dimension. After the Eggman Fleet launched from Bullet Station, all the teams have been searching for a way to intercept the flying armada. The pursuit took them through Hang Castle, but now they must find a way to escape. Team Sonic and Team Rose just want to stop Eggman, while Shadow and Team Dark are determined to interrogate him. The Chaotix, meanwhile, are assigned by their client to extinguish the torches within the castle; this allegedly being necessary to escape. At the end of the level, "Eggman" appears, to sic legions of robots on the heroes in Robot Storm. 36,000 32,000 28,000 20,000 <20,000 Escape from the haunted castle! 58,000 50,000 40,000 25,000 <25,000 Escape from the crazy castle! 45,000 40,000 35,000 25,000 <25,000 Escape from the haunted house! 25,000 20,000 15,000 10,000 <10,000 Blow out all 60 red torches! 36,000 32,000 28,000 24,000 <24,000 Get to the Goal Ring within 7 minutes! 11:00 11:30 12:00 13:00 >13:00 Defeat 100 enemies! 3:30 4:00 4:30 5:00 >5:00 Collect 200 rings! 20,000 18,000 15,000 10,000 <10,000 Blow out all 46 blue torches! This is the only stage where all teams start at the exact same point. In the very first room, there is a picture of the whale island from Seaside Hill. While playing as Team Sonic, there is a secret room that can be entered. In the room with the first Heavy Egg Hammer, there are invisible torches that can be lit with Fire Combination. Normally, this room is only accessible to Team Dark and Team Chaotix (save for Super Hard Mode) but only 1 last room that's only accessible for Team Chaotix is unused for other teams and Super Hard Mode and is only optional area with a cheating device. The room looks pretty much the same as it does in Team Dark's mission. The most notable difference is that there is a warping flower in the corner. It is completely useless to Team Sonic as they can be only used by Team Chaotix. It is possible to go further into this stage with Team Rose without the use of a cheating device. In the room with the giant statue, there are three switches. The switch to the far right will change the statue's position where it has one arm raised towards the hole in the ceiling. Grind on the spider web and jump of at its highest point while in Fly Formation. Cream can make it up there no problem. The stage composition will appear like Team Sonic's. This is also the only legal way for Team Rose to encounter a Heavy Egg Hammer. However it becomes impossible to go any further after the dark room with the ghosts because Light Dash is needed to get to the next room. Sonic and his friends are running in the circular hallway. Team Sonic grinding on the spiderweb originated by a spider. The distorted, ghost-filled bottom of the well. This page was last edited on 8 April 2018, at 07:54.